Purpose: This study aims to analyze the outcomes of surgical correction of exotropia in children between 4 to 12 years of age; and the factors associated with favorable surgical outcomes. Methods: In this prospective observational study, the surgical outcomes of 87 patients between 4 and 12 years of age, who underwent correction for primary exotropia (XT), by a single surgeon, were analyzed at 24 months. Results: Out of the total 87 patients, 46 (52.87%) were female and 41 (47.13%) were male. The mean age at surgery was 8.83 ± 3.26 years (range 4–12 years). There was a statistically significant reduction in preoperative prism bar cover test (PBCT), with PBCT at day: 1, 1 month, 6 months, 12 months, and 24 months after surgery (P = 0.00, ANOVA). Among the 42 patients analyzed for near stereoacuity (NSA), the change between preoperative and 24 months NSA was not statistically significant (P = 0.55, Chi-square test). Preoperative PBCT for distance was found to be a significant parameter associated with successful motor alignment at 24 months (P = 0.02, logistic regression). Other variables such as gender, age at surgery, preoperative best-corrected visual acuity, preoperative refractive status, and laterality of surgery were not significantly associated with successful motor alignment at 24 months. Conclusions: Surgical correction of exotropia in children between 4 to 12 years shows satisfactory ocular alignment at 24 months; although there was no significant improvement in NSA in the subgroup analyzed. The preoperative ocular deviation was the only significant factor associated with successful motor outcome at 24 months after surgery. Undercorrection: exotropia/phoria ≥13 PD postsurgery. There was a statistically significant reduction in preoperative PBCT, with PBCT at day: 1, 1 month, 6 months, 12 months, and 24 months after surgery (P = 0.00, one-way ANOVA) [Figure 1]. Preoperative NSA could be reliably assessed only in 77 patients. 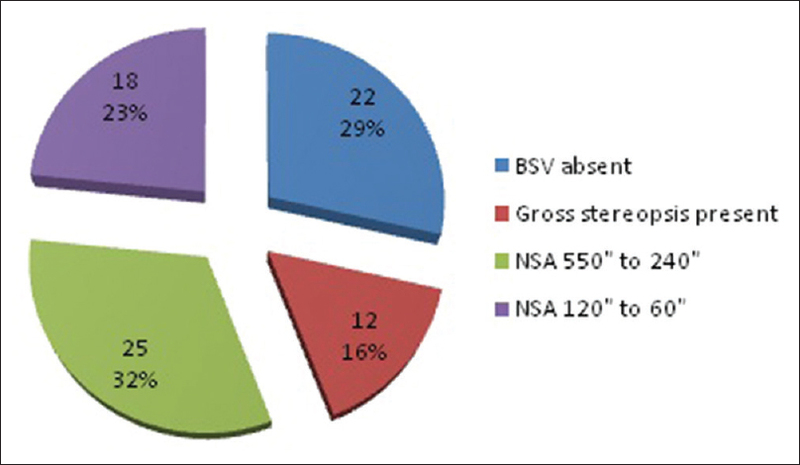 Out of these patients, the binocular single vision was absent in 22, gross stereopsis was present in 12, NSA between 550 and 240 s of the arc was present in 18 and NSA between 120 and 60 s of arc was present in 25 patients [Figure 2]. Out of the total of 87 patients, 75 (86.21%) were assigned to the successful motor outcome group (SG), and 12 (13.79%) to the failed motor outcome group (FG) [Figure 3]. Among the FG, 9 (10.34%) had residual exodeviation 17.50 ± 3.50 PD at 24 months follow-up. Six of these patients had good cosmetic alignment after the initial surgery, while three had residual exodeviation. These three patients underwent second surgery after 6–8 months and had satisfactory alignment at 24 months. 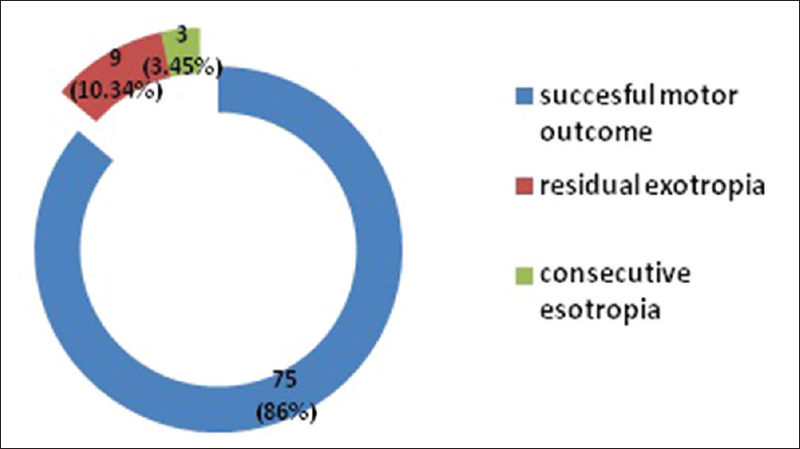 Out of the total 87 patients, 3 (3.45%) developed small consecutive esodeviation (7.00 ± 1.50 PD). As there was no drop in visual acuity or ocular alignment even at 24 months, no further procedures were done on these patients. 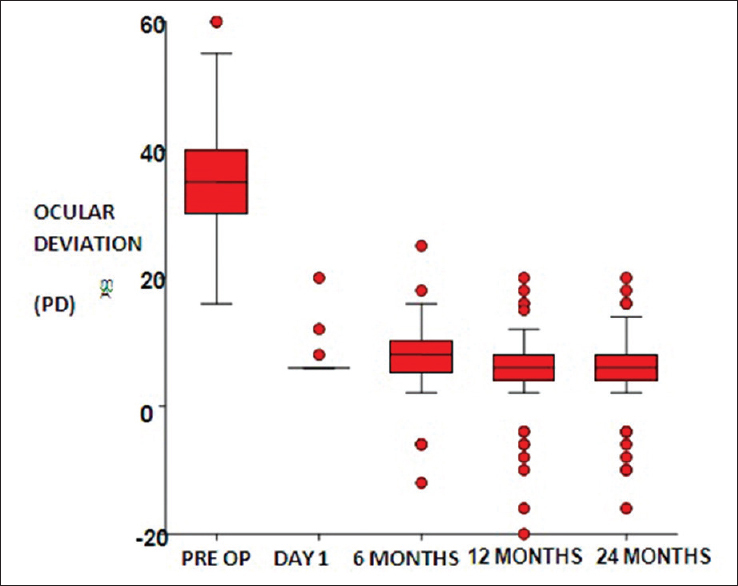 Logistic regression analysis was used to analyze the relationship between surgical outcome at 24 months month postsurgery and the preoperative parameters including gender, age at surgery, preoperative best-corrected visual acuity (BCVA), preoperative refractive status, preoperative PBCT for distance, and laterality of surgery. The preoperative PBCT for distance was found to be a significant parameter associated with successful motor alignment at 24 months (P = 0.02). Other variables did not have significant association with successful motor alignment at 24 months [Table 1]. Jenkins R. Demographics geographic variations in the prevalence and management of exotropia. Am Orthopt J 1992;42:82-7. Chia A, Seenyen L, Long QB. A retrospective review of 287 consecutive children in Singapore presenting with intermittent exotropia. J AAPOS 2005;9:257-63.
von Noorden GK, Campos EC. Binocular Vision and Ocular Motility: Theory and Management of Strabismus. 6th ed. St. Louis, Missouri: Mosby, Inc.; 2002. p. 356-76. Pratt-Johnson J, Wee HS. Suppression associated with exotropia. Can J Ophthalmol 1969;4:136-44. Hatt SR, Leske DA, Yamada T, Bradley EA, Cole SR, Holmes JM, et al. Development and initial validation of quality-of-life questionnaires for intermittent exotropia. Ophthalmology 2010;117:163-80. Pineles SL, Ela-Dalman N, Zvansky AG, Yu F, Rosenbaum AL. Long-term results of the surgical management of intermittent exotropia. J AAPOS 2010;14:298-304. Kim HJ, Choi DG. Clinical analysis of childhood intermittent exotropia with surgical success at postoperative 2 years. Acta Ophthalmol 2016;94:e85-9. Huda S, Asim T, Abdulbari B. Factors affecting the surgical outcome of primary exotropia in children. Br J Med Med Res 2016;16:1-9. Oh JY, Hwang JM. Survival analysis of 365 patients with exotropia after surgery. Eye (Lond) 2006;20:1268-72. Burke MJ. Intermittent exotropia. Int Ophthalmol Clin 1985;25:53-68. Beneish R, Flanders M. The role of stereopsis and early postoperative alignment in long-term surgical results of intermittent exotropia. Can J Ophthalmol 1994;29:119-24. Edelman PM, Brown MH, Murphree AL, Wright KW. Consecutive esodeviation Then what? Am Orthop J 1988;38:111-6. Ekdawi NS, Nusz KJ, Diehl NN, Mohney BG. Postoperative outcomes in children with intermittent exotropia from a population-based cohort. J AAPOS 2009;13:4-7. Maruo T, Kubota N, Sakaue T, Usui C. Intermittent exotropia surgery in children: Long term outcome regarding changes in binocular alignment. A study of 666 cases. Binocul Vis Strabismus Q 2001;16:265-70. Adams WE, Leske DA, Hatt SR, Mohney BG, Birch EE, Weakley DR Jr., et al. Improvement in distance stereoacuity following surgery for intermittent exotropia. J AAPOS 2008;12:141-4. Mohney BG, Huffaker RK. Common forms of childhood exotropia. Ophthalmology 2003;110:2093-6. Caltrider N, Jampolsky A. Overcorrecting minus lens therapy for treatment of intermittent exotropia. Ophthalmology 1983;90:1160-5. Chia A, Roy L, Seenyen L. Comitant horizontal strabismus: An Asian perspective. Br J Ophthalmol 2007;91:1337-40. Scott AB, Mash AJ, Jampolsky A. Quantitative guidelines for exotropia surgery. Invest Ophthalmol 1975;14:428-36. Saleem QA, Cheema AM, Tahir MA, Dahri AR, Sabir TM, Niazi JH, et al. Outcome of unilateral lateral rectus recession and medial rectus resection in primary exotropia. BMC Res Notes 2013;6:257. Choi J, Kim SJ, Yu YS. Initial postoperative deviation as a predictor of long-term outcome after surgery for intermittent exotropia. J AAPOS 2011;15:224-9. Buck D, Powell CJ, Rahi J, Cumberland P, Tiffin P, Taylor R, et al. The improving outcomes in intermittent exotropia study: Outcomes at 2 years after diagnosis in an observational cohort. BMC Ophthalmol 2012;12:1. Abroms AD, Mohney BG, Rush DP, Parks MM, Tong PY. Timely surgery in intermittent and constant exotropia for superior sensory outcome. Am J Ophthalmol 2001;131:111-6. Asjes-Tydeman WL, Groenewoud H, van der Wilt GJ. Timing of surgery for primary exotropia in children. Strabismus 2006;14:191-7. Pratt-Johnson JA, Barlow JM, Tillson G. Early surgery in intermittent exotropia. Am J Ophthalmol 1977;84:689-94. Folk ER. Surgical results in intermittent exotropia. AMA Arch Ophthalmol 1956;55:484-7. Ing MR, Nishimura J, Okino L. Outcome study of bilateral lateral rectus recession for intermittent exotropia in children. Ophthalmic Surg Lasers 1999;30:110-7. Richard JM, Parks MM. Intermittent exotropia. Surgical results in different age groups. Ophthalmol 1983;90:1172-7. Stoller SH, Simon JW, Lininger LL. Bilateral lateral rectus recession for exotropia: A survival analysis. J Pediatr Ophthalmol Strabismus 1994;31:89-92.